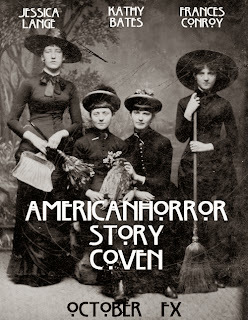 I love American Horror Story. It is creepy and funny, macabre and menacing, cruel and campy, and I can't get enough of it. Three years ago when Ryan Murphy and Brad Falchuk first aired American Horror Story, my reaction was, "That guy from Glee is doing horror?" Exactly. While the show is often horrific, it is also terribly funny. The writers walk that razors edge with remarkable skill. Just when you think you need to look away, it becomes the height of camp. At the moment you think, this it too silly, you are slammed back into the nightmare. One would be hard pressed to ever think, "I know what will happen next." 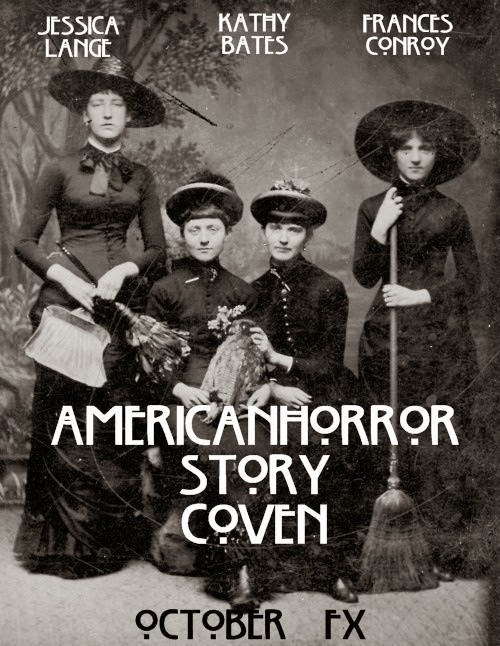 The first season of American Horror Story, now called Murder House revolves around the the classic haunted house that fills many a horror story. That became a self-contained mini-series. The second installment, American Horror Story: Asylum, took on another great horror trope, the mental institution. While the story remained horrific, the setting and local were very different. The actors (many of them) remained the same. 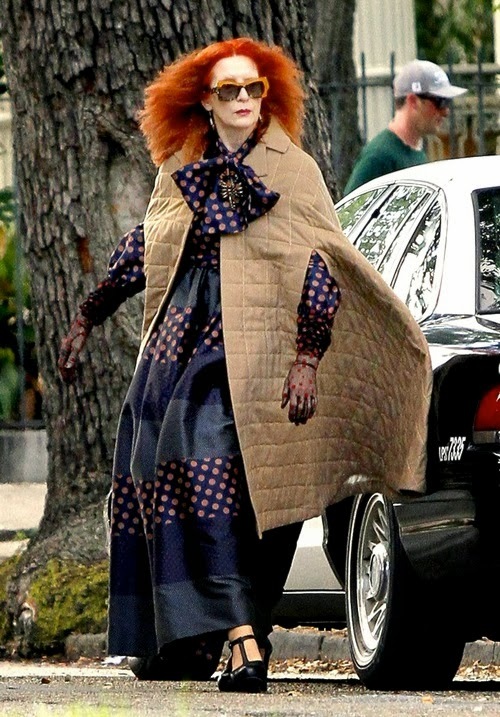 American Horror Story: Coven, is set in New Orleans at a finishing school for witches. Over the three incarnations, Murphy and Falchuk have kept together a repertory-like collection of actors that appear and re-appear. With a television landscape that is often formulaic and filled with cookie cutter actors, American Horror Story breaks the mold. First, many of the actors are women of advanced age. Remember in Hollywood, after age 25, an actresses age is measured in dog years. Rarely does one see a television show where the lead actress in in her 60's, much less a show where several of the pivotal characters are actresses in their 60's. As for younger actresses, they all seem to blend together in one homogeneous pot of straight teeth, straight hair and Size 0 dresses. It doesn't really matter which Jennifer is Chloe, which Jessica is Madison, nor which Madison is Jennifer. In the American Horror Story world there is a diversity that one rarely sees. Jamie Brewer, who was in Murder House and now in Coven, has Downs Syndrome. Oscar-nominee Gabourey Sidibe is no Size 0, yet they fill the screen with the likes of Lily Rabe and Emma Roberts, bringing a complexity to the casting that is liberating. 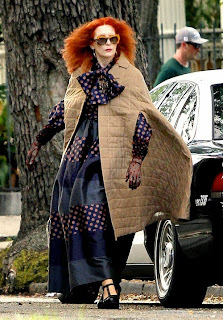 My favorite actor in the bunch is Frances Conroy. Best known for playing the long-suffering wife, Ruth, in Six Feet Under, her various roles in American Horror Story have been a joy to watch. 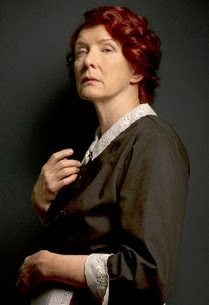 In Murder House, she played Moira, the maid who came with the house, no mater who the owner. to some rather comical encounters. 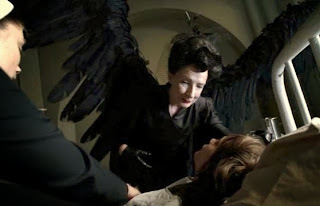 In Asylum, Conroy was the Angel of Death, appearing in a prim black suit and veiled hat. At the moment of death, however, she sprouted enormous black wings before planting a literal kiss of death on the lips of her intended. 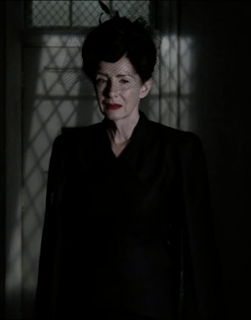 Our first glimpse of Conroy in Coven is as the grandmother of young witch, Taissia Farmiga, and her appearance is memorable. The first year it was televised, I had a real-life American Horror Story moment. On Wednesday, Murder House began with a knock on the door. The owner answered to find a man with blood dripping from his head. He said he had been in accident and needed help and they let him in. Everyone in the house was, of course, tortured and murdered. Two days later, I heard a knock at my door. No one comes to the house after dark! I went to the door and opened it on to the mudroom. Standing at the door was a man who said his friend was hurt and needed help. My heart almost exploded. But I live in the real world and not the television world. I called an ambulance and told them they needed to get to the post office, as the ambulance won't go out to farms in this area. It was midnight before my heart stopped racing. The next day, two of the guys came back with flowers for me. They thanked me or helping. They were on 4-wheelers when one of the group got hurt. He was an EMT so he knew he was in bad shape. Before they could get down off the mountain, night fell and they couldn't find their way out. An old logging road led them to my light. Their friend made it to the hospital with sever injuries and was air-lifted to Pittsburgh. I told them about American Horror Story and they gave me a big hug. "I'm not sure I would have opened the door, " one of them said. Indeed. As a fan of American Horror Story, I started watching it because of Murphy and Falchuk, who also did Nip/Tuck. It was perfection and always high on the queasy factor.